Ancient India Stories Mahabharata and Ramayana: Ancient India is truly a rich source from the literary point of view. There were a variety of works which came to be published. These works were suitable for people of varied age groups right from small children to old people. 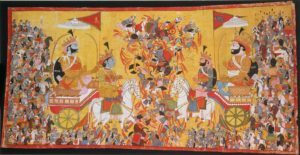 The Mahabharata is still today, one of the two major Sanskrit epics of ancient India. 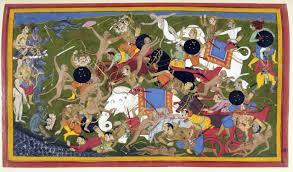 The crux of this epic work was the narration of the Kurukshetra War and the fates of the Kauravas and the Pandavas. Besides this, the Mahabharata also contained philosophical and devotional material, such as a discussion of the four “goals of life” or Purusharthas. These Purusharthas are dharma (right action), Artha (purpose), kama (pleasure), and moksha (liberation). Among the principal works and stories which form a part of the Mahabharata is the Bhagavad Gita, the story of Damayanti, an abbreviated version of the Ramayana, and the Rishyasringa. These all are often considered as works in their own right. The author of the Mahabharata is believed to be Vyasa. This epic which contains about one hundred thousand verses, long prose passages, which are around 1.8 million words. In total, it is approximately ten times the length of the Iliad and Odyssey combined, and around four times the length of the Ramayana. The Ramayana is another ancient Sanskrit epic whose authorship is ascribed to the Hindu sage Valmiki. 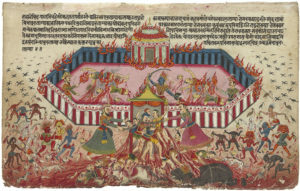 This Ramayana depicted the duties of relationships, by portraying ideal characters like the ideal father, ideal servant, the ideal brother, the ideal wife and the ideal king. The name Ramayana is a Tatpurusha compound of Rama and Ayana which translates to “Rama’s Journey”. The Ramayana consisted of 24,000 verses in seven books and tells the story of Rama who was an Avatar of the Hindu preserver-God Vishnu, whose wife Sita is abducted by the demon king of Lanka, Ravana. Verses in the Ramayana are written in a 32-syllable meter called Anustubh. The epic was an important influence on later Sanskrit poetry and Indian life and culture. Unlike the Mahabharata, the Ramayana was not just an ordinary story but it contained the teachings of ancient Hindu sages and presented them in narrative allegory with philosophical and the devotional elements interspersed. The characters Rama, Sita, Lakshmana, Bharata, Hanuman, and Ravana were all fundamental to the cultural consciousness of India. Apart from Mahabharata and Ramayana, Panchatantra was an ancient Indian collection of animal fables in verse and prose, in a frame story format. This original Sanskrit work means ‘Five principles’ whose authorship has been attributed to Vishnu Sharma in the 3rd century BCE.